ELECOM (Elecom). inner-ear (AV earphone) high-resolution music files corresponding to the "hi-res sound source"! adopted φ12.5mm driver and a high-rigidity brass housing, stereo headphones to reproduce the strong overwhelming high-quality sound. Communication range: approx. Supported Bluetooth profile: HFP, HSP, A2DP, AVRCP. ( )Lithium battery is used for this product. The light weight design, weighing just 16 g, along with the use of secure arms allow you to wear it for long hours without getting tired. 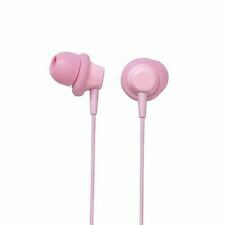 A high-quality stereo sound earphone in high resolution. It optimized to reproduce powerful bass and crisp high-quality stable. Speaker input impedance: 16. The maximum allowable input: 100mW. Reaction pressure: 100dB / 1mW. Sensitivity: 96dB / 1mW. The earphones that can use a combination of three sizes of silicone ear ring and a cap of four different sizes for optimal fit. Reproduction frequency band: 20Hz ~ 20kHz. Cord Length: 1.2m (Y type). Plug: φ 3.5 mm 3 pole mini plug (L type). Mounting type: ear plug type. Accessories: Ear cap (S / M / L), Code keeper, Pouch, Warranty card. Color: Gold. High sound-quality stereo headphones that support high resolution music files, also known as hi-res audio. This allows the headphones to respond smoothly when reproducing sounds from the low to high ranges. HiRes Canal type Stereo Headphones EHP-CH2000GD Gold. Color: Gold. Mounting type: ear plug type. Plug: f 3.5 mm 3 pole mini plug (L type). 100% genuine Item. The arrival of the item is 2-4 Weeks on average. Elecom High Resolution Corresponding Stereo Earphones Canal Type 12.5Mm Driver Gold Ehp-Ch2000Gd. â—� Corresponds To The Inner Ear (Av Earphone) High-Resolution Music Files "Hi-Res Sound Source '! â—� Adopted Î¦12.5Mm Driver And A High-Rigidity Brass Housing, Stereo Headphones To Reproduce The Strong Overwhelming High-Quality Sound. HiRes Canal type Stereo Headphones EHP-CH2000SV Silver. Color: Gold. Mounting type: ear plug type. Plug: f 3.5 mm 3 pole mini plug (L type). 100% genuine Item. The arrival of the item is 2-4 Weeks on average. ◆ High resolution sound source compatible stereo headphones "BLACK BLACK BLACK". EMS USD 15 USD 21 USD 23 USD 28. ◆ Adopted proprietary PDD system with piezo tweeter and dynamic driver. Release Date: 2016-11-12. Sound sensitivity: 100 db. Cable length: 120 cm. employs 12.5 mm drivers, the mature sound with powerful bass reproduction. shut out excessive vibration and adopted a rigid brass housing, arise from the driver yoke. Color: Gold. Plug: φ 3.5 mm 3 pole mini plug (L type). You need to get an import permit from Ministry of International Trade and Industry tog get your item if your item is more than 1000 MXN. Our products are 100% authentic. ELECOM (Elecom). ELECOM EHP-CH2000 GD Hi-Res St. ereo In-Ear Headphones Gold NE. W from Japan. All wink warranty repairs are carried out by the manufactures here is Japan. Color: Gold. We are not sure if you can use in your country and can't be able responsible for it. Condition : New. We will reply within 24 hours normally. Japan Usage Item. [ Li-ion Battery ]. [ Electronics ]. [ Country of Manufacture ]. [ Warranty ]. Plug: φ 3.5 mm 3 pole mini plug (L type). Middle East. Color: Gold. Mounting type: ear plug type. Even if you think to yourself, "But the item I want is only available in Japan.". We will look for and suggest the best products on your behalf. ELECOM HiRes Canal type 12.5mm driver CH2000 Gold EHP-CH2000GD Japan new . 5 out of 5 stars - ELECOM HiRes Canal type 12.5mm driver CH2000 Gold EHP-CH2000GD Japan new . 1 product rating1 product ratings - ELECOM HiRes Canal type 12.5mm driver CH2000 Gold EHP-CH2000GD Japan new . Color: Gold. (More than a month). It takes a while (depends on a country but about a month). Plug: φ 3.5 mm 3 pole mini plug (L type). (It might be more than a month). I correspond from the bottom of my heart. Elecom Stereo Earphone Compatible With High Resolution Ehp - Ch2000 Gd Canal Type 12.5 Mm Driver Gold Ehp - Ch 2000 Gd. â—� Corresponds To The Inner Ear (Av Earphone) High-Resolution Music Files "Hi-Res Sound Source '! ƑÓ12.5mm employs a driver and a high-rigidity brass housing, to reproduce the strong overwhelming high-quality sound. ELECOM (Elecom). ☆Quantity last one. ☆Release Date. ☆Condition. Japan Usage Item. ● inner-ear (AV earphone) high-resolution music files corresponding to the "hi-res sound source"! ● adopted φ12.5mm driver and a high-rigidity brass housing, stereo headphones to reproduce the strong overwhelming high-quality sound.